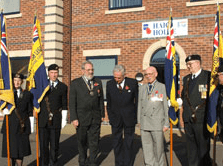 Saturday 4th November, Lord Lieutenant of Staffordshire Mr James Hawley TD JP MA, officially opened the new Royal British Legion in Staffordshire and SSAFA Offices, Haig House on the Stafford Technology Park. County Field Officer Captain Peter Smith welcomed the Lord Lieutenant to the site, with introductions firstly to Mr Geoff Davis acting President of North Staffordshire and Mr John Brookes MBE President of South Staffordshire. 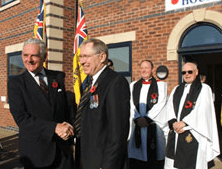 A short service conducted jointly by Rev John Davis the Branch Secretary of SSAFA Staffordshire and the North Staffordshire County Padre Rev Eric Last blessing to the building. Followed thereafter by the official plaque unveiling, a speech in support of the Royal British Legion in Staffordshire. The Lord Lieutenant then cut the ribbon and introductions to officers and officials of North and South Staffordshire followed. In attendance were County Chairman Mr Peter Murphy (South) , Mr Ken Compton (North), Mrs Morris County Chairwoman (South) Staffordshire Women’s Section. County Secretaries Mr John Cotton (North) and Mr Mike Morris (South), Mr Martyn Tighe (Board of Trustees member West Midlands) Mr Bob Rankin (County Web Manager), County Standard Bearers Derek Moreton (South), Derek Bunting (North) Doreen Hickman (South Staffordshire Women’s Section), George Grey (Newcastle, Chesterton & District), Mr Martin Shufflebotham (County Field Administrator) and Ms Amanda Danells-Smith (Community Fundraising Officer) and other guests. ← A TIME CAPSULE IN A WAR MEMORIAL!